I finally broke down and organized all of my collage bits, mostly just the images. It was quite the process! I went through every single book I had been hoarding and ripped out the pages and images I thought I would someday use in a collage. I had at least 30 books to go through! It took days, to say the least. I also had some scraps that had been ripped out; they were scattered in those little ikea boxes. After ripping out page after page, I sorted them into piles that would work well for me. I came up with about 10 categories: anatomy, animals, backgrounds, maps, misc, objects, people, places, plants, and space. I have a small, two-drawer filing cabinet that I picked up at a local thrift store. The first drawer is used for all of my Dactyl Life stationery and business paperwork. I decided to use the second drawer for all my collage bits. I made the tabs for each file and then filled them up with paper! I originally thought I wanted to store my paper bits in binders, like I’ve seen a few people do. My only concern with that was how frustrating/difficult it would be to get the image you want out of the binder. I saw that people placed multiple images in one sheet protector and that just seemed like such a hassle. 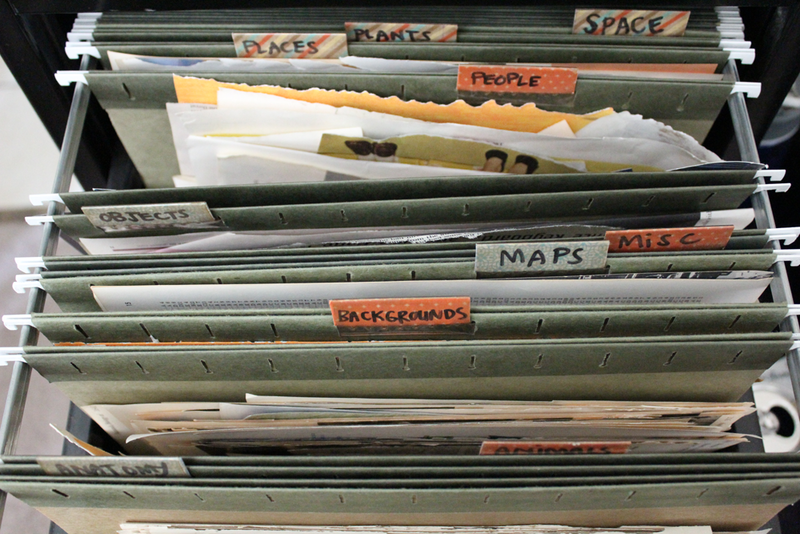 That is my favorite thing about storing images in file folders — it’s so easy to sort through them! This is seriously such an easy a way to keep organized and find things in a flash. I don’t know how I didn’t think of it sooner! I wish I did. I recently became kind of fed up with collage because I couldn’t stand sorting through my books and random scraps of paper to find the things I wanted. Whenever I had an idea in my head or inspiration to collage, the excitement to sit down and create was quickly replaced with the frustration of not being able to find the things I was looking for. Pulling book after book out of my cabinet was exhausting. Now I have this great system and I’ve been collaging a lot more. And I got rid of all of my books, which freed up a ton of space. One thing that I have found that is key to getting and staying organized is by having set categories or spots for things. That is one of the major reasons why I started organizing all of my washi tape in those wax paper roll boxes. They have a set place to go and I find that I’m not throwing them about my desk, where ever they might fit. The same goes for collage bits! I started making digital collages when I started designing stationery. Although I have been making “real” collages for over 10 years now, I have only been doing things digitally for over a year. I always wanted to sell my mail art but it would be so time consuming to create each unique piece by hand; I wouldn’t have time to actually write letters! To make things easier on myself, I scanned in my collection of images, ephemera and whatever paper bits I had, and started creating collages through Photoshop. Well, Photoshop Elements, because I’m cheap. Watching people create things is seriously one of my favorite things to do. I think that is probably my favorite thing about the internet. I love watching people do things I can’t (or am too lazy to learn). I love watching people paint, draw, write calligraphy, you name it. I even like watching people do things I can do (like mail art!). I think I’ve watched almost every YouTube video there is of people making mail art. I finally found a free program to capture my computer screen by video so now I get to contribute to the world of creative process videos. Check it out below! To celebrate my first computer-screen video, I am sharing the file for the envelope I created in the video. Check it out! It is a PDF file, you can print it on a regular 8.5×11 piece of paper. You will have to cut it out and fold it! Over the weekend I put together a few ephemera packs to list in my shop! I really enjoy putting these together. I love searching through my stash of papers, stickers, and images. All of the items I put into these packs are stuff that I would use in my own collages. And, if you’re my pen pal, you’ve probably received some of these items in my letters! In addition to putting together these packs, I am also (slowly but surely) going through my hoard of books. I have A LOT of books just hanging out for possible use. I’m going through each one and tearing out the images that I would use. I hope to become a bit more organized with my collage images because, right now, I’m just not. I saw Esther’s collage binders and thought that was amazing. I hope to pick up some binders soon to stick my images in. For now, I’m just going to keep them in my filed away by image type. I’m thinking categories like people, floral, objects, anatomy, animals, landscapes, backgrounds, and “I don’t even”. How do you store your paper bits?